Save Time Organizing School Volunteers! School activities are more FUN when more parents pitch in! 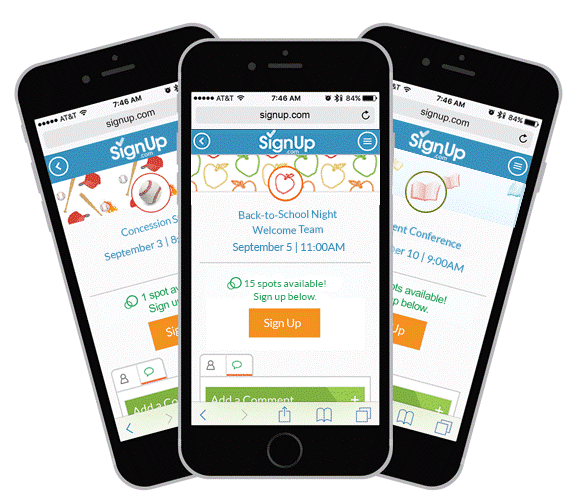 Boost parent participation at this year's school parties, fundraisers, sporting events, you name it - with free, online class party SignUps from SignUp.com. Build volunteer interest forms and volunteer calendars in minutes, invite parents via email or social media (they never need a password!) and rely on eCalendar syncing and automated reminders to keep everyone on track.
" SignUp.com made it so easy to organize over 300 parents for our upcoming fall events, we can't thank you enough! "